Oooh, Shinies! : And here's fall on my nails! And here's fall on my nails! Good morning! I had something different in my mind for this mani, but sometimes it's hard to imagine how it'll turn out on the nails, and this was one of those moments. But in the end, it did all come together I think :) No sure if I should've mattified it though, that took away the soft shimmers in the sponged polishes. Nevertheless, it sure feels nice to wear such colors again! I started with a coat of the polish that I used for stamping as well, and sponged on the 3 Trind polishes (all 3 from their Beauty of Nature collection). Then I applied 2 coats of the very sheer, yellow-ish tinted Bellisimo, to pull it all together a little more. Stamping, top coat, mattify and done! 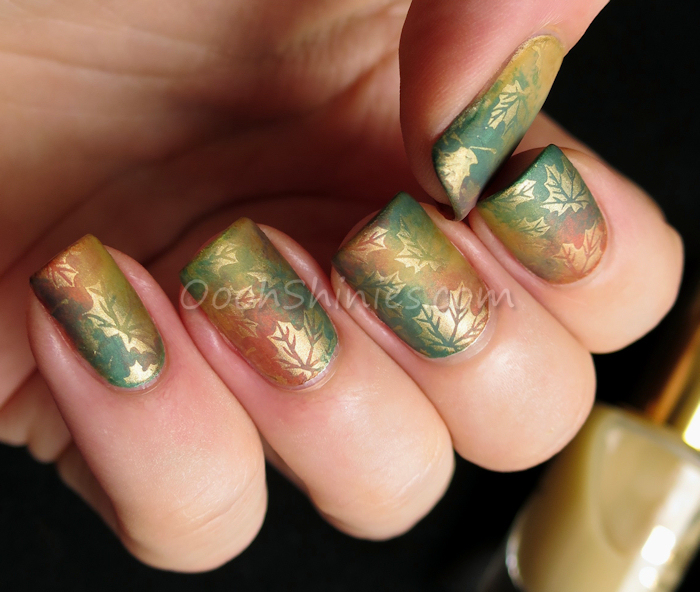 Essence A Piece Of Forever sponged with Trind Emerald Swirl, Golden Leaves and Sunset Orange, Bellisimo Jerusalem Stone, Essence A Piece Of Forever and BornPrettyStore BPL-024 & Dance Legend Top Satin. Last summer mani of the year?